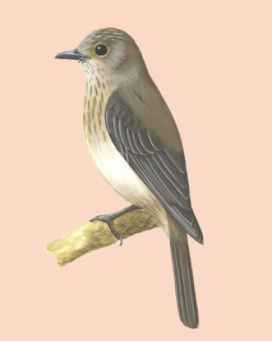 Physical characteristics: Both sexes of spotted flycatchers have brownish gray bodies and white undersides, with long tails and long wings. Some have gray streaks along their throats. The birds have black bills and short, black legs. Young birds have brown bodies and spotted undersides. This is where the species gets its name. They are 5 inches (12.7 centimeters) long. Geographic range: Spotted flycatchers can be found in Europe, Russia, western Asia, and North Africa. They spend the winter in southwestern Asia and Africa. Habitat: Spotted flycatchers prefer forests with deciduous trees, trees that lose their leaves in winter. These forested areas can be natural or cultivated as in orchards, parks, and gardens. Because they feed from high perches, they often hunt in cleared areas between trees. Diet: Spotted flycatchers eat flying insects. Behavior and reproduction: Spotted flycatchers swoop down from perches where they watch for flying insects, capturing them while in the air. They frequently return to the same perch to wait for more prey. These birds build an open nest in a recess, hollowed out area, usually in a wall, a crotch of a tree, or a tree hollow. They will also nest in open-fronted nest boxes. Females lay four to six greenish eggs with rust colored spots. 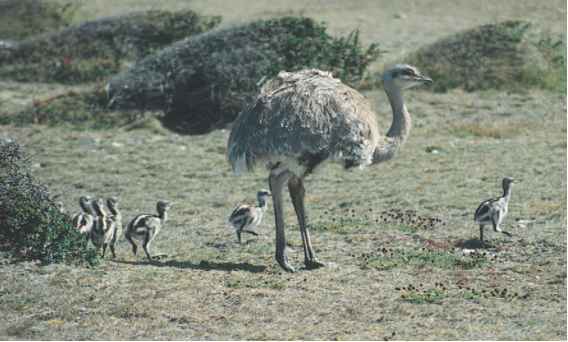 Members of this family winter in Africa and southwestern Asia as single birds. They return to their territories as the season changes. The song of the spotted flycatcher is a series of six squeaky notes. Spotted flycatchers and people: This species has no special importance to humans, except to be appreciated by birdwatchers. Conservation status: The population of spotted flycatchers is declining in parts of their territory but they are not threatened.